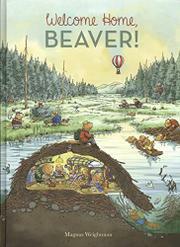 A young beaver sets off on an adventure, but can his friend Akita and his hot air balloon help Beaver find the way home? While the cover may evoke memories of Richard Scarry, the contents quickly disabuse readers of that comparison. Rhyming couplets that are frequently off in terms of meter, scansion, and rhyme sink this effort: “ ‘Do you live in this romantic and colorful love nest?’ / ‘The bowerbird built this, Akita, and his sweetheart is impressed.’ " The duo’s trip, outlined on a world map at the end, includes looks in cross-section at the homes of foxes, bees, harvest mice, storks, termites, weaverbirds, bowerbirds, hermit crabs, sand tilefish, and prairie dogs before Beaver finds his lodge. But the text is not the only flaw here: the illustrations are busy and sure to keep readers occupied, but the animals are distractingly anthropomorphized. The male bowerbird presents the female with a single red rose, with lit candles and a bottle of champagne on ice in the background. The walruses sprawl on the ice in T-shirts, muscle T’s and trucker hats, the lone female in a skimpy purple bikini; most are holding drink cans in their flippers. Several animals are seen smoking. While the depiction of the beehive is a rare and refreshing exception to the unfortunate wasps’-nest norm, this colony has elected to build its comb from tree branches rather than in a hollow trunk and will probably perish come winter. Expressions are largely wooden, especially Beaver’s and Akita’s.